G-Shock from Casio, known for its High-Tech Gadgetry and Hyper-Durable Range of Watches announces its association with the ‘Indian Extreme Nationals 2.0’ for the second year running. The Indian Extreme Nationals organised by Extreme Sports Association of India, (XSAI) is a nationwide competition for extreme sports lovers and enthusiasts showcasing the potential and scope for this niche sports genre in the country. Extreme sports are gaining huge acceptance and popularity among India’s youth. To drive this passion and encourage extreme sports, Casio’s G-Shock promotes extreme sports through this platform as a high-energy and adventurous sports genre in India. With participation of over 140 athletes from across the country, G-Shock is catering to the Indian youth who is sportier, fitness focussed and passionate to take extreme sports of the country to an international level. G-Shock aims to offer a platform for sports activities that are trending worldwide. Extreme Sports Association of India, (XSAI) is the official Indian Association to train, facilitate and grow the sports of Skateboarding & BMX cycling in India, conduct Nationalchampionships and represent India in International Extreme Sports challenges. XSAI is affilliated with the AXF (Asian Extreme Sports Federation) which represents (ISF) International Skateboarding Federation and (IBMXFF) International BMX Freestyle Federation in Asia. AXF (Asian Extreme Sports Federation) is affiliated and recognised by The Olympic Council of Asia. 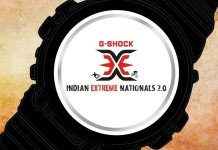 Indian Extreme Nationals 2016 (IEN) was the first official Open Nationals organised by the Extreme Sports Association of India.